Is the soft, rich earth under our feet sacred? Indeed it is! So too are the circles of the sky, the sun and moon, also the wind our children take into their lungs and the waters which flow before a birthing occurs. All of these things are truly special in the eyes of the eagle. Weak and unsure of life at the time my sobriety began, I searched aimlessly to find a healing place. At last, I found it where the waters fall over the ancient rock of a small, obscure river. Slowly but surely, the songs sent forth from the water at that sacred place, washed away from my aching spirit, all the filth my severe addiction had placed upon it over those many wasted years of my alcohol-fuelled life. 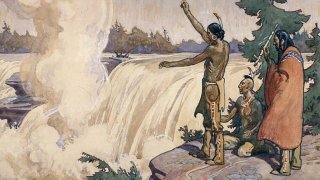 Some people teach us today that sacredness exists in many places, that Akikodjiwan (Chaudière Falls) is not necessary as a place of rejuvenation and healing. They point to places like the one where my sobriety began and say, “Healing occurs there, too.” To me, comparing the small falls where my recovery began to the spiritual grandness of Akikodjiwan is like the comparing of a single needle from the branch of a majestic pine to the wonder and greatness of the entire tree itself. Akikodjiwan stands alone as the one true leader of all healing places in Anishinabe Territory. Let there be no doubt or confusion about it! If there are Algonquin chiefs who fail to understand this, it would not discourage me all that much. You see, the chiefs are responsible for their own spiritual journeys as I am for mine. The chiefs have no authority to interfere with the right Creator gave me to embrace a spirituality placed on Turtle Island since the time of our creation. No chief, nor politician, nor developer, nor any amount of money can take that right from me nor from anyone else. The right to freedom of religious expression cannot be toyed with. Even Canada’s Constitution protects it. Even the United Nations defends it. The chiefs who would block the Peoples of Turtle Island access to Akikodjiwan need to back off at least until all the voters they represent know full well what is spiritually at stake here. As emotionally troubling as it is, there are human beings among us who believe that ‘spirit’ is no longer present at Akikodjiwan. (I’m serious.) Driven out they say, by industry and pollution. But the fact is and always will be that the so-called ‘Almighty Dollar’ itself will never possess the strength to chase the spirits of our ancestors from our most sacred site. Only the People can do so by rejecting the fact that we too are entitled to our own spiritual beliefs. When we no longer call out to them (the spirits at Akikodjiwan) during our time of need and when we find ourselves in a time of sorrow, the songs at Akikodjiwan will then only be heard by the animals of the field and by the birds of the sky, soaring over our once perfect homeland. The Almighty Dollar will finally have conquered the People and will rule over us brutally and ruthlessly, and without conscience. Our ways will be lost, existing only as shadows or caricatures of something which had served human beings so well in the past before the arrival of money and technology. I give fair notice at this time: I intend to initiate a class action lawsuit, ASAP, against the NCC, Catherine McKenna, the Governor General of Canada and Justin Trudeau for their failure to do what is right and for their roles in continuing the genocide of the First Nations Peoples. If Akikodjiwan is further defiled by the erection of condos and by commerce upon it, the people and institutions named above will pay dearly for their part in allowing it to happen. This is my promise! If a developer dared to give notice to the rabbi, the imam, the priest or minister, and informed them that their house of worship would be ripped down regardless of their protest and be replaced by condos, I would stand with the faith leaders in their opposition to such an outrage. I would donate time, energy and resources to protect their sacred place. I would do so, boldly and without fear of political repercussions. I expect the faith leaders of Ottawa and of the world to do the same for me. The original People will fight to return the faith and spirituality of our forbearers back again to assist us in our recovery as Anishinabeg nations. This entry was posted in Community, Spirituality and tagged Akikodjiwan, Albert Island, Algonquin, Anishinabe, Asinabka, Chaudière Falls, Chaudière Island, condos, DreamCorp, Great River, Justin Trudeau, Kichi Sipi, Lebreton Flats, OMB, Ottawa, Ottawa River, Petition, Reconciliation, Reconciliation River, sacred land, sacred waters, spirituality, unceded, UNDRIP, Victoria Island, Westeinde, Windmill Development Group, Zibi. Bookmark the permalink. Chi-Miigwetch Albert. I will bring the Sacred Pipe I made to your peaceful protest march. The Sacred Pipe is the ultimate Anishinaabe symbol, ritual, and ceremony of truth and reconciliation. Creator gave it to First Woman’s son before the rest of humans came to the Earth. It is intended to generate peace and love within all relationships. Power to our sacred traditions and the Pipe. The argument that all land is sacred is a pitiful excuse to further destroy a particularly sacred place. It is unfortunate that through practices of cultural genocide many Algonquin are unable to rationalize this. The rituals of capitalism has polluted too many minds and hearts. I stand whit you let me know when and where I will be there. Niawa. Though I most whole-heartedly agree with everything you have written, I am troubled by one thing that you say. I am not so sure that the spirit of the place, of any place, even at Akikodjiwan, can be driven out just because the People reject it, or because the People choose to vote on what happens to that land. The Power of our Mother Earth does not die simply because people choose to make a vote to do or not do something. Look at what is happening in places like Detroit Michigan in the USA, where the “Almighty Dollar” chased itself to it’s so-called logical conclusion, so that now much of it is abandoned and destroyed, whereas it was once covered by homes filled with the white people. It is now turning back to farm land, or back to nature, as it once was, now that those homes are no longer standing. Now that the “Almighty Dollar” has destroyed all that stood there. They may build what they want, but the truth is, it will never stand there, if the land is strong with the Spirit of the place. I support your efforts to take legal action against them, since this is all that they understand. They have never thought that we would learn to use their own system against them. Or that we, being “noble savages”, would be intelligent enough to learn their ways also, while still maintaining our own values, & be able to use their own methods against them. Go forth & fight the good fight. I will follow it, & do anything I can in support of it. It is time the flood of 2017 the pain and trauma of citizens losing homes due to people invested in money rather than living from their indigenous hearts that has led our culture to become disassociated from nature and the deep spirituality of all our indigenous peoples. We must to be fully human remember our own ancestors and our own indigenous hearts to feel and to listen deeply to see: that where in the wind we experience being fully connected to Spirit and love the energy that empowers us to feel and to care for each other and for nature. Beyond the pain of fear, hate or greed at any cost we see compassion growing as neighbors see it is time to walk in solidarity now to care for the land and waterways of Mother Earth. And for each other.. that governments the people we elect to be our voice must be held accountable as we all walk in peace led by our religious spiritual leaders like ourselves. All citizens who care whose pain has become the compassion we all in these times of great Climate Change need to feel so we can rise up in hope beyond pain. To be the actions walking together to take positive constructive actions towards changing the way we treat each other and the Earth and water.. To respect all is sacred, water, earth, wind to live from deep gratitude and respect. That we as One Earth’s peoples politically and legally all citizens need to rise up as One voice to say enough to rezoning sacred land and waterways for profit.. they must be cared for and stewardship is a response ability for all citizens to walk in solidarity with our First peoples leaders such as Elder Albert Dumont and all religious spiritual leaders of Canada and the world as they pray and walk together with political leaders such as Elizabeth May and other conscious leaders will see this Mother’s Day the full realization of Standing Women’s initiative to invite all citizens of Earth on May 14 at 1:00 pm to 1:05 pm local time to visualize the new world we all see as being a world and Earth where all children thrive! So to with Elder Albert Dumont may we all walk on one cause.. to give a message to all politicians that Canadian citizens will elect and support all leaders who put the land and water of sacredness and respect back into the hearts and lived experience of all Canadians. To be the vision of A Culture of Peace and A Circle of all Nations that the late Algonquin Spiritual Leader Grandfather William Commanda saw for his people and all citizens of Mother Earth all of us inclusively called to care and to walk together in peace, hope, love and compassion for each other and our One home to live the sacredness of peace mutual equality and respect is to pass this legacy on to all future generations. Then all our children and future children’s children will indeed thrive. Thank you Elder Albert Dumont and Elder Douglas Cardinal and Grandmothers and Clan Mothers world wide for inspiring us to light this the eighth fire of right relationship in these turbulent times is opportunity to change and to grow as One Universal Spiritual Humanity. ” We are the One’s we have been waiting to meet!”Hold space in your hearts and envision this to our new shared humanity the power of love for all to thrive! There has been quite a bit of discussion on this over the last 7 years. (especially since the death of Grandfather William Commanda) Today is a good day to act. Usually the old nuggets of ‘not everyone agrees, not everyone opposes’ is pulled out to create the blatantly self-righteous cover for not entering into a deeper awareness and understanding of what is being requested and what is still being done locally to suppress Indigenous spirituality. The local political status quo has not changed at all when it comes to the local historical spiritual/religious abuse. It is still standing. Most people, average Canadians, through personal lives that are too crowded with normal day to day obligations are collectively predisposed to continue to turn a politely blind eye to colonial religious privilege happening in our own city. This is an unavoidable consequence we are all dealing with from the willfully created ignorance that was imposed on all of us by our historically racial legal and cultural social economic systems. This ignorance is a fact that is not easy for us to look at, or to change. But, it is a fact and it is real and especially pernicious here in Ottawa. Are we so afraid of simply being willing to say, we recognize and hold seriously our ability and responsibility to support the Algonquin right to restoration and recovery from 500 years of spiritual abuse. Can we not say we recognize that Indigenous spiritual expression is indivisibly expressed through ceremonies which center on learning from and respecting the traditional rights of all life forms, land, air and water based. Algonquin people have suffered locally due to the failures of interfaith compassion, interfaith respect. This is unceded territory. There is no agreement no treaty or legal status that has been surrendered by the Algonquin or the Mohawk for that matter. I can connect you with historians on this. The right to practice Indigenous spirituality, here, where it was always practiced, which is THE inconvenient point to politicians and commercial lobbyists, in a location that is currently dormant from industrial use, is a real clash of rights..
People, Indigenous and Non-Indigenous alike who don’t care about restoring the historical traditional Indigenous Spirituality here don’t care about that clash. The Indigenous spiritual relationship to the planet is not a concept that is shared by or contained in, our political system or monetary system. Treating life, any life whether water or land or wind based as a commodity, is inhuman to Indigenous spirituality. That is why this is so hard. The potential for healing or harm is global. Can we not at least say that we are willing to walk with and come into the circle with the Algonquin spiritual leaders about their spiritual rights? By the way all are unanimous in their identification of the Chaudiere and its Islands as the one most important historical site of peacebuilding ceremonies in this city. We, and all faith leaders are being asked to support them in the restoration of their right to practice their spirituality in their traditional ways, according to their spiritual customs, which to them means particularly in this currently undeveloped traditional location? Not all Christians, Jews. Hindus, Muslims or Buddhists agree on everything within their own communities. I hope that doesn’t mean that we feel our own faith allows us to just sit idly by and allow that to be our excuse for silence in the face of this need for restoration support by this spiritual community. There is a continuing and historically sophisticated policy of oppression preventing Algonquins who want to practice their spirituality in this traditional location. If un-challenged legal interpretation systems will be permitted to dismiss the importance of practicing traditional ceremonies, in traditional locations simply because we, and most Canadians don’t really understand what is being asked and offered. I think we all know that our own faith often asks us to take a leap. For me, my faith is saying I need to walk with the Algonquin Spiritual Grandmothers and Elders to discover what their faith is asking of us. I’m simply inviting my ‘Church’ to do the same. Thanks to the Elders and Grandmothers for asking.